Very simply, all our items are "light activated." Strong direct sunlight through a window will cause active chiming and spinning. Less light slows them down. Even low evening lamplight will cause occasional activity. With that in mind, they can be modified by turning the solar cell away from, or toward the light source. Any type of light will do. If low light or no strong outdoor light is available, we suggest displaying under a table lamp with any type of light equaling a 100 watt incandescent bulb. For nighttime rest, it will not work. No light,no chiming! If silencing is desired, simply remove the striker. How do you replace the batteries? Green is in! You can stop looking; there are no batteries to throw away or replace. Our products don’t require batteries, electricity, or wind to function. 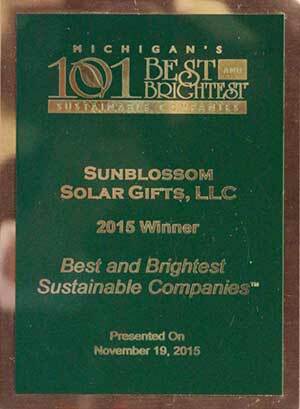 Sunblossom’s "Green” initiative has been a part of the company’s philosophy from the start. We are winners of several Michigan awards for not only our "Green” products, but also our recycling efforts which include "rescuing” boxes and packing materials from local businesses and landfills. By purchasing Sunblossom Solar Gifts products, not only is pleasure derived, but a partnership is created with our earth-friendly practices! Where are the chimes made? All designs are ours and assembled in Manchester, Michigan, USA. The owner, Bonnie Greenwald, is also an artist. 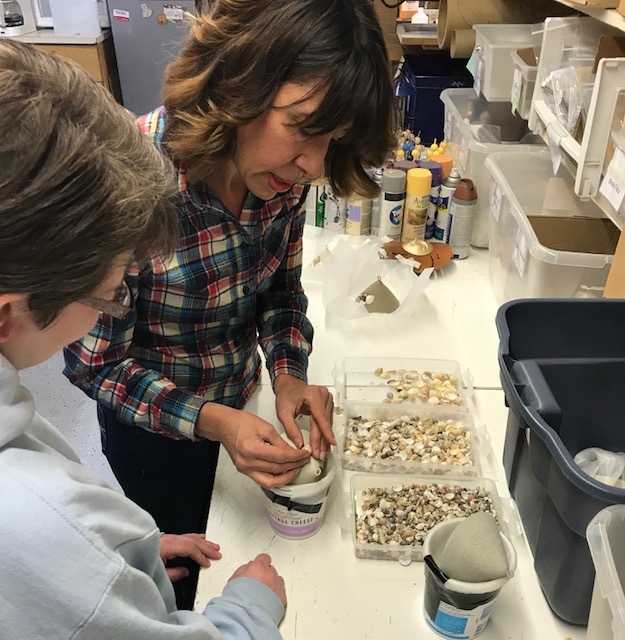 She designs the products, going through several steps of fine tuning and locating suppliers for the raw components. Sunblossom workers produce as many product components as possible "in house”, (i.e. casting certain resin parts from molds.) Other parts like stands are out-sourced, although the owner designs them as well. In some cases, "cottage industry” is used. Sunblossom is proud to provide some jobs to a local charity. Eisenhower Center rehabilitates clients with closed head injuries and related issues. Often this includes war veterans. Solar drills holes!! Chime rods are drilled for us by a worker who is "off the grid." The electronic components (the technology that makes our products function), are not produced anywhere in the USA. Thus, Sunblossom products do not have 100% USA made components. Regardless of the sources, all components are brought into our Manchester location. Then our amazing group of "Chime Chicks”, assemble, box and ship our products. Who buys these products? People who discover the soothing nature of the sweet and gentle chiming and movement and how it resonates in their lives. They like to pass on the their pleasurable discovery to friends and family as gifts. 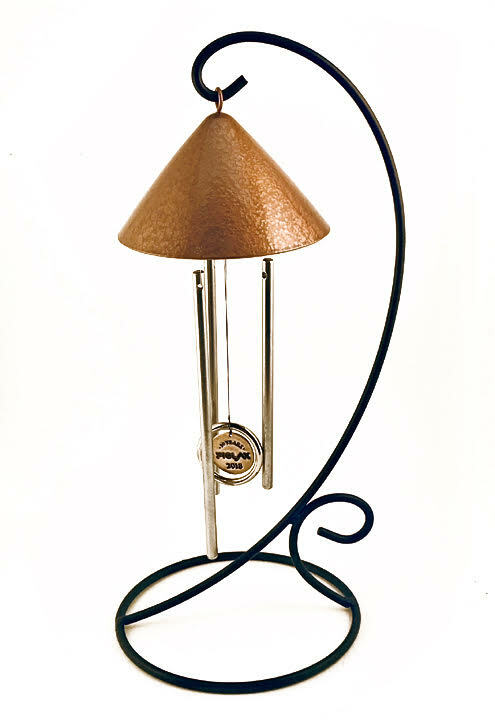 Our products appeal to broad demographics: those who love wind chimes, solar power, "Green”, natural and organic products, and have a wide range of incomes. They choose quality and service over price.